snips snippets: Ahem, shall we call this post the one where i remember that i have a blog and i really should use it more often. Yep, i won. And to be honest folks, it's been a couple weeks now and it still hasn't sunk in. I won. 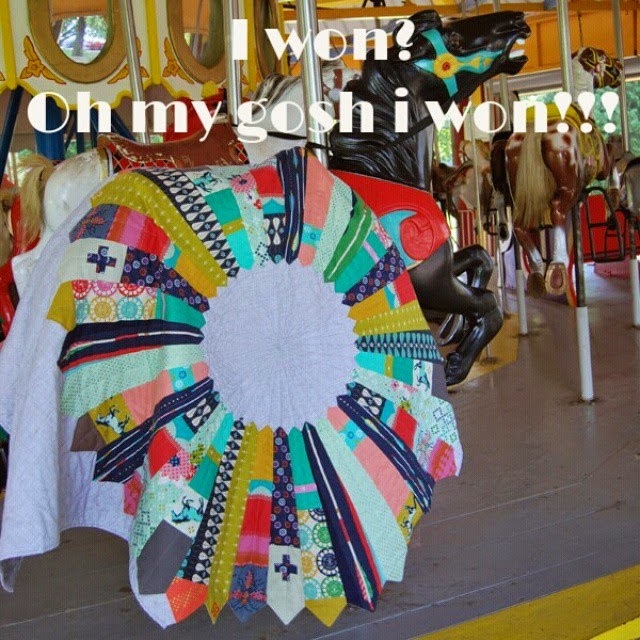 Holy crap i won! Yippeeeee! I'm am so very thankful to each and every one of you. It was a long journey and i never would have made it without all your support and encouragement. I've had a few people ask if i would do it all again, and i most definitely would! That being said, it was stressful, very stressful. I truly didn't think i would make it as far as i did. When i started Sewvivor i had a number of secret projects on the go as well as some other projects that all kind of fell to the side. And i kept telling myself that it would be fine and when i was eliminated i would get back to my regular sewing. And then i'd make it through to the next round. And the cycle kept going. I'm still trying to get caught up! And that is the only negative thing that i experienced with this whole adventure. And it's entirely my fault. I guess i really could use some time management help around here, i've never been any good at getting things done on time! Now i don't want anyone thinking that i'm not grateful, i'm not complaining, i'm just keeping it real here ;) It was an absolutely amazing experience and i've made some truly great friends. One in particular that would have been worth it all even if i had been eliminated the first round. Thanks so much Angie for cheerleading me to the finish line! And i have to say, i'm ecstatic about the prizes! My first one showed up the other day and man it's awesome! Coats and Clark sent the huge pack of threads and Free Spirit fabrics obviously had someone checking me out because all this AMH loveliness came without anyone asking what i would like! Love me some AMH! I haven't really worked with knits all that much and i don't own a serger so any advice is greatly appreciated. I'm thinking i'll use the two prints in the middle for leggings. The pink Cracking Codes print on the left is super soft, so soft i thought it was flannel. I'm wondering if i could back a quilting cotton quilt with it? Has anyone ever done that? Though i do have all my little guys onesies from when they were babies and i've been wanting to cut them into a nice patchwork throw for me... maybe i'll save it for that? I don't know. High fives for me for winning Sewvivor, and high tens for all you guys for your help getting me there! You guys are the best! Oh, and for those interested i am making up a pattern for the hexie cushion, i've never written a pattern before so if anyone has any sites that may help or any tips on what you like or don't like in a pattern i would be eternally grateful! I'm also working with someone to put out a pattern for my Carrousel quilt in the new year so stay tuned for that! And i'll be having a giveaway and tutorial coming up the end of the month!! Obviously I'm behind the times, but congratulations just the same! What an experience. Lovely projects all. Congratulations on winning!!! It's so well deserved. 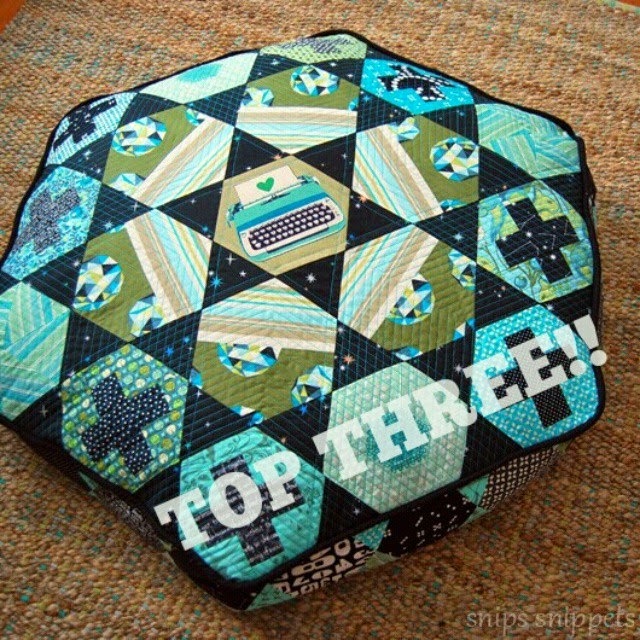 :D That hexi cushion is SO awesome!! I don't have any sites to offer help with writing patterns (but if you hear of any let me know please!) but what I did was look at lots of tutorials and patterns. Picked out what I liked that they did, changed what I didn't. Not super helpful I realize, sorry! Congratulations! I love your hexie cushion and look forward to your pattern! I have a pile of flannel waiting for that cushion tutorial. Pink flannel. I mean, I could make a quilt, but a floor cushion would be even more awesome. Congratulations. Your projects were great, so the win was well deserved. Yaaay! Those prizes are great, I can't wait to see the next batch you get in mail! Congratulations! 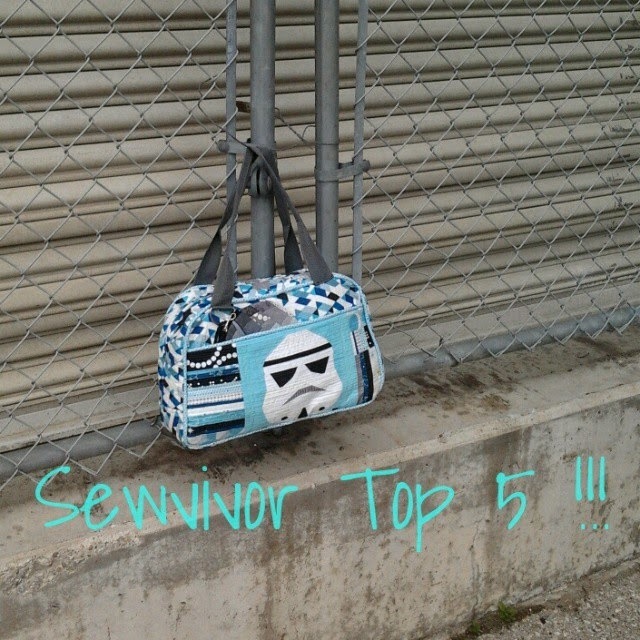 You had me at the storm trooper pouch and the awesomeness just kept on coming!! I love the hexicushion and would love to test for you when you get to that point. As far as patterns go use a lot of pictures and try not to be too wordy. It is a hard balance between explaining something well and going overboard. Oops! Blog forgetfulness comes from IG use. 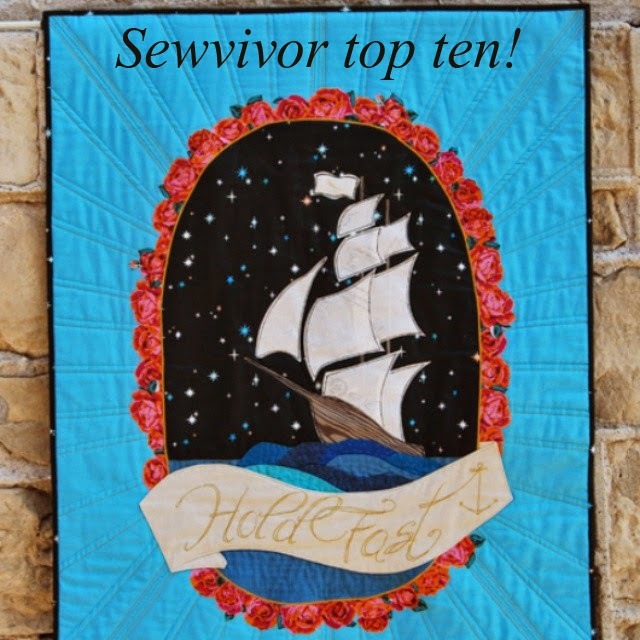 So fun to revisit your Sewvivor projects!! You were definitely at the top of your game with each and every project!!!!! I have never used knit as a quilt back but I think the stretch and give that it has would be really troublesome with shifting. They would work great as small baby blankets :) or you could make yourself some skirts or tees. 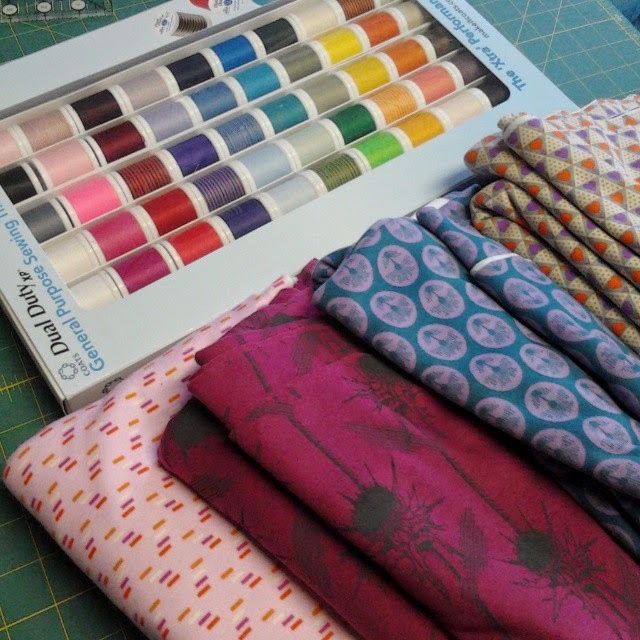 I can't wait to see what tute you have up your sleeve and am looking forward to your patterns!!! You totally deserved to win and I am so happy for you. I wasn't surprised by your blog hiatus- I figured you were taking a break and catching your breath! Congratulations. You're too funny! Congratulations! I can't wait for those patterns! Yay, what an exciting stuff to come. All your projects were great so all the prizes are well deserved. I'm so excited for you - that quilt is AMAZING. I just started sewing with knit, if you don't have a serger use a small zig zag stitch. It will let the fabric 'give' and help prevent the stretching when sewing. Enjoy your goodies! Woohoo! I'm so thrilled that you won - everyone was amazing, but you were my pick from the start (my sister from another mister... and missus). I can't wait to see you conquer the sewing world. Thanks so much for the shout out - you realize I feel exactly the same way, right? Not to get all sentimental and sh!t ;) :) Big love! Congratulations on winning! I am sure it was a very exciting experience and you made lovely projects! Well done! Hi Nicole. I am following you everywhere now. LOL! I just heard you on Modern Sewsciety and I went to look for your blog in my bloglovin feed and realized I didn't have it there! Somehow I missed following you after all the Sewvivor excitement. Anyway, it's totally awesome that you won and even more awesome that you are Canadian which I didn't realize before but I saw on your Etsy shop that you are in Guelph. I've been there once to visit my husband's Uncle and Grandmother but they aren't there anymore. Hi from Alberta and congratulations again on your fantastic win!